Donald Trump’s hosting gig on Saturday Night Live went pretty much as expected: The show was awkward, stilted, and unfunny and about nine million people tuned in to watch it (that’s 57 percent higher than the show’s usual fall ratings average). But while it might seem like Trump was a major player in the show given how many lines he flubbed, in actuality the presidential hopeful appeared on SNL for only about 12 minutes. Trump’s time on the show was very specifically managed because under the FCC’s equal-time rule, networks are required to provide the same amount of air time to all presidential candidates so as to not unfairly sway voters. That means it was to NBC’s benefit—not to mention the audience’s—to keep Trump’s screen time limited (one sketch consisted of Trump sitting offscreen “live tweeting” the performance). Thus, according to Deadline, NBC just released an announcement saying that those who can prove they’re “legitimate candidates” (we’re looking at you, Martin O’Malley and Bobby Jindal) have one week to claim their 12 minutes and five seconds in the sun. A similar message went out after Hillary Clinton made a cameo on SNL a few weeks ago, offering candidates 3 minutes of airtime. But since surprise SNL political cameos are more common than hosting gigs, the Clinton announcement flew under the radar. 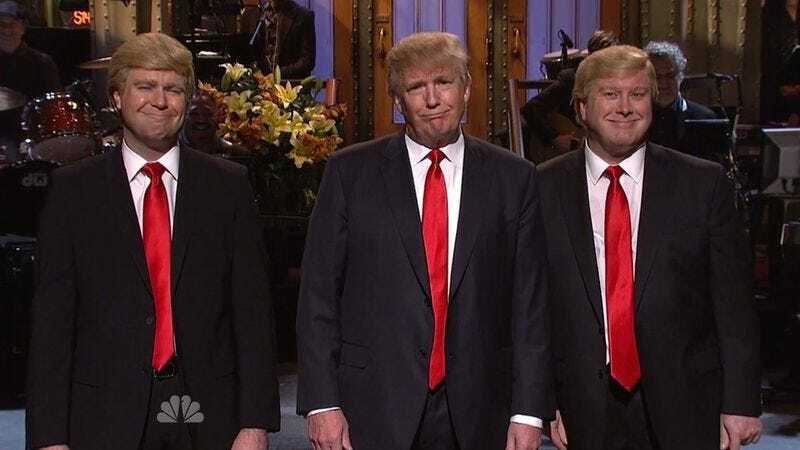 The other candidates aren’t guaranteed a slot on SNL, and if any of them do claim their time, it will more than likely be provided on a news program (Entertainment Weekly breaks down the ins-and-outs of the equal-time rule). But, personally, we’d prefer to live in a world where Ben Carson gets a 12-minute cameo on Undateable Live, Bernie Sanders guest judges a few contestants on The Voice, Jeb Bush appears as a tattoo on Blindspot, and Rand Paul finds the perfect work/life balance on The Mysteries Of Laura. Of course should all the presidential candidates claim their 12 minutes and five seconds, NBC will have to dedicate more than three hours of programming to them. Which would probably still be better than Best Time Ever.